Photograph captioned by BeckerFraserPhotos, "The River Avon from New Brighton Road, near the intersection with Locksley Avenue". 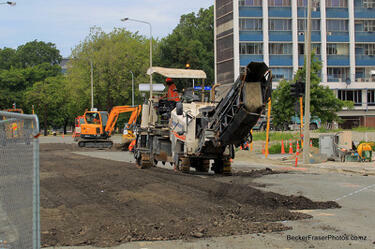 Photograph captioned by BeckerFraserPhotos, "A road maintenance crew working on Madras Street". 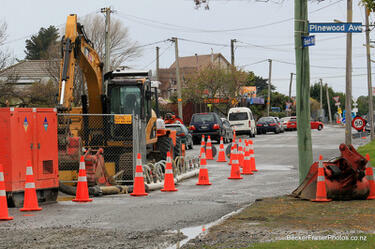 A photograph captioned by BeckerFraserPhotos, "Road maintenance crew working on Madras Street". Photograph captioned by BeckerFraserPhotos, "Workers putting in power poles on the corner of Madras and Armagh Streets". 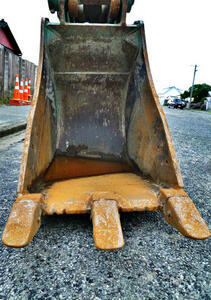 The claw of a digger. 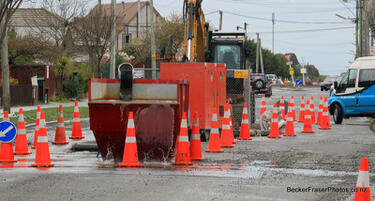 In the background is a stack of road cones. 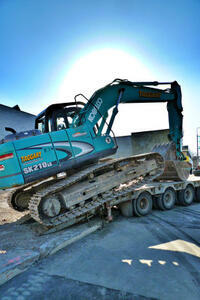 The photographer comments, "Digger Claw ready to start digging". 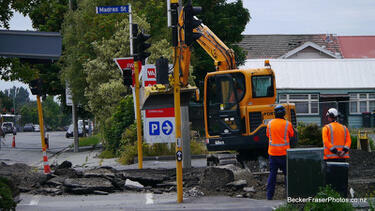 A digger being loaded onto the back of a truck. 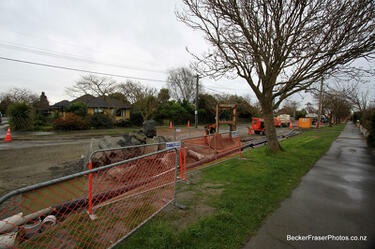 The photographer comments, "After clearing away the remains of a building in Christchurch, New Zealand destroyed by the February 22 earthquake the digger can now be transported to its next destination for destruction". 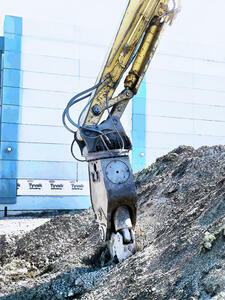 The head of a digger resting on a pile of soil next to QEII Stadium. 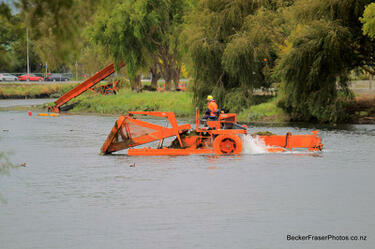 The photographer comments, "The deconstruction of the QEII stadium in Christchurch pauses on a Sunday". 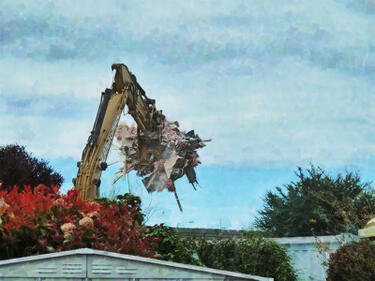 A digitally manipulated image of an excavator demolishing a house. 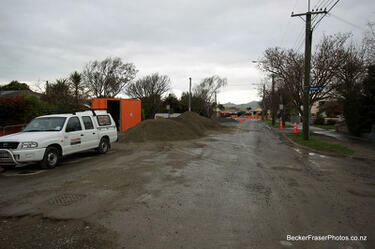 The photographer comments, "My neighbour I thought was going to be one of the first to be rebuilt in the area after being damaged in the 22 February 2011 earthquake, but the builders have knocked it down and not returned yet". 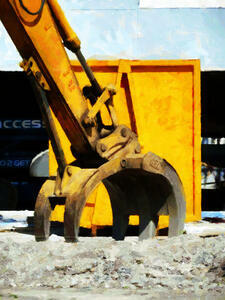 A digitally manipulated image of the head of a digger resting on a pile of soil. The photographer comments, "You can go anywhere you like when you are a rock star". 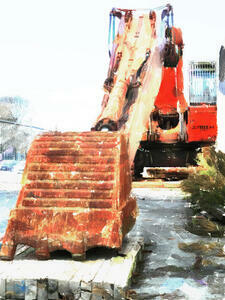 A digitally manipulated image of an excavator. 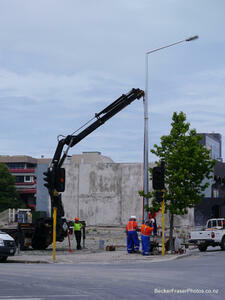 The photographer comments, "This is a huge excavator in the Christchurch CBD. 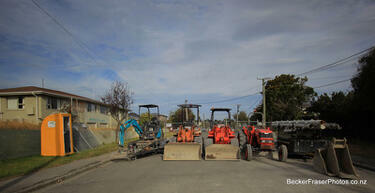 It is being used to clear away the enormous amount of rubble from the buildings being demolished. It seems that nearly all the big machinery from all other the world has been needed in the clean up of the earthquake damaged buildings and utilities". 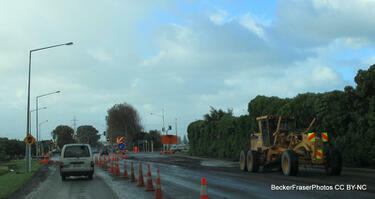 Photograph captioned by BeckerFraserPhotos, "Dyers Road under reconstruction, adding about 30 cm to its elevation". 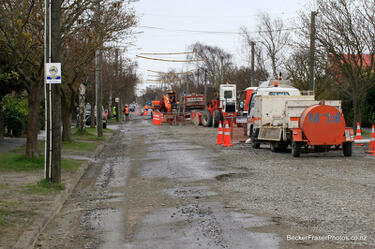 Photograph captioned by BeckerFraserPhotos, "Avondale Avenue - this piece of the street is classified as residential red zone on the left and residential green zone on the right".